Welcome New Master Food Volunteers! 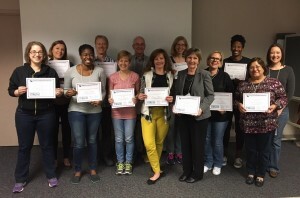 On April 22 a group of thirteen new Master Food Volunteers completed their training and will soon begin serving the community by helping to lead cooking and nutrition classes. The spring 2016 class of Master Food Volunteers completed their training last Friday. The volunteers come from Alexandria, Arlington, Fairfax, and Prince William Counties. The training was led collaboratively by Jennifer Abel, Nancy Stegon, and Katie Strong, Family and Consumer Sciences agents who cover the above mentioned city and counties. Van Do and Katrida Williams, new SNAP Ed FCS agents who serve Alexandria, Arlington, Fairfax, Loudoun, Prince William, Stafford, and Spotsylvania Counties, also helped lead the training. Volunteers will help to lead nutrition education and cooking classes for groups throughout Northern Virginia. Examples of programs in which they will be involved include: Cooking Matters for Kids classes, SNAP outreach at farmers markets, Chefs Clubs for middle schoolers, healthy cooking classes for senior citizens, food preservation classes, Balanced Living with Diabetes for Spanish speakers, nutrition education at food pantries, and many more. The new volunteers will join 93 current Master Food Volunteers who have been trained at some point since 2012 when the program began. We welcome the Spring 2016 cohort and look forward to working with them! When will the next training be and how can one sign up? Hi Romana, the next Master Food Volunteer training is accepting applications now with a January 20th deadline. The training will begin in March. All the details are here. Hope to see you in the next training!